Get your hands on some dotmesh shirts. News and Insights. dotmesh. 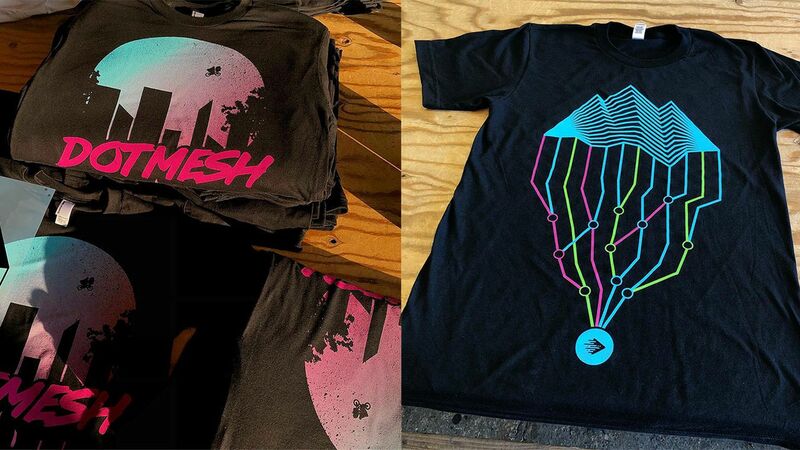 Get your hands on some dotmesh shirts. We've got swag with your name on it (not literally). If you were at KubeCon 2018 recently, you may have seen some of our stickers knocking around the place. They’re kind of big, neon and hard to miss. Perhaps you picked up a guitar pick with a strange new symbol on it. Yep, that was us too. So it gives me great pleasure to announce that the swag-train has now fully pulled into the station with the (almost) arrival of dotmesh T-Shirts to add to the fleet, and the great news is they can be yours for the low, low price of ZERO-DOLLAR. That’s right folks, we’re literally giving them away. If you’d like to get your hands on some of the first editions, then here’s what you gotta do. P.S. All shirts come in a range of colours as long as you want black (to paraphrase Henry Ford). 2. Choose your fit and size. Fitted shirt by Earth Positive Continental. 100% Combed Organic Cotton. (This is described as a ‘Women’s Open Neck Shirt’ by the supplier, but we think fitted is a more, erm, fitting term. These are fairly large, so err on the smaller side). Straight cut shirt by American Apparel. 3. Let us know your details. Garment type and size preference. We’d love to see pictures of you in your swag, so we’d really encourage you to take some pictures and tag us in them. We hope you enjoy your swag! We’ve got a limited number, so once they’re gone they’re gone. First come first served. If we’re out of your size, we’ll send you the closest size up unless you tell us different. If we’re out of your chosen design, we’ll send you one of the others. We’ll cover the cost of postage to you, but can’t be responsible for any customs or import charges if they’re applicable in your country. If you are in India you may be asked to provide ID to receive a shirt from the UK, as per Indian import laws. We’d advise washing the shirts on their own the first time in case of any ink bleed.